As we're heading into the spooky time of year, there's been plenty of great things on tv to watch ! And today I started watching the new Sabrina reboot. Definitely different to the one I watched in the late 90's! So, what else should I be watching ? I loved The Haunting of Hill House! It was so good. I just started Channel Zero The Dream Door. It’s a SyFy show. It’s weird and creepy. This is the 4th season but I’m not sure where you’d find the others. Each season is based on a different creepy pasta so it doesn’t matter if you watch the other seasons. They’re short too, this one is only 6 episodes. Edited by lorac61469, 28 October 2018 - 07:39 AM. I signed up for a Netflix free trial and started watching House on Haunted Hill. After the first few episodes I thought it was slow and confusing. But the first few ones were kind of 'setting the table', so to speak. From episode 3 on it got WAY better, and is (IMO) a modern classic of horror. Plus the acting and writing are top notch, this is a quality production. Well worth the watch. I've seen the commercials for the new Sabrina reboot. I would love to hear what everyone else think that have watched it. I think it could be her evil twin. LOL. The new Sabrina show is being sued. The Satanic Temple filed a lawsuit on Thursday against Warner Bros. and Netflix, alleging copyright violation of its goat-headed statue, which it says appears in the new “Sabrina” series. The temple objected to the use of the statue’s likeness in the “Chilling Adventures of Sabrina,” which features a much darker portrayal of the teenage half-human, half-witch immortalized decades ago in Archie comics. In the lawsuit, filed in United States District Court in Manhattan, the plaintiffs ask for at least $50 million for each alleged infraction: copyright infringement, trademark violation and injury to the business’ reputation. They also request an injunction barring the companies from redistributing the series with the image of the statue. 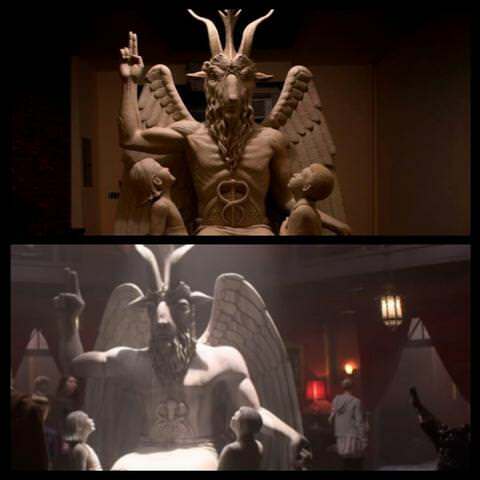 The temple argues that the television show not only copied its conception of the deity — a muscled figure with two young children staring up at it — but also that it gives the statue and the Satanic Temple itself a bad rap. The Satanic Temple, based in Salem, Mass., defines its mission, in part, to “reject tyrannical authority” and to “encourage benevolence and empathy among all people.” Last year, the temple drew headlines for sponsoring a billboard in Texas that condemned corporal punishment. I think the plaintiffs are thinking "cha-ching" with this. it's not too bad but yes, a lot darker than what I've watched previously! I watched both Sabrina and the Haunting of Hill House from start to end. Sabrina, the first episode was terrible. After that it got better. By the end of the season, it was very interesting. Not creepy though. Just a bit of gore here and there. Hill House on the other hand... that was creepy. I found myself keep my hands and feet away from the edges of the bed in the dark lol. That was incredibly well done. Artists, even when using "traditional and ancient motifs" still hold rights to the use of their work. This particular statue is an artists very specific and identifiable work. Used without the artist's permission, or payment to the artist. (and yeah, this is an issue for me because I've had strangers grab my photos of my CAT for pete's sake off my site and packaged them in "copyright free stock photography" CD that they were selling... that's not how copyright works, a third party can't just take a piece and claim it's clear for use without ASKING. Yes, you can clearly see the similarities between the two statues. I understand The Satanic Temple's Baphomet that cost $100.000 came from the likeness of Levi's (1856) Baphomet. I still think TST asking the courts to award damages of $50 million for each infraction, is all about the money. I think Levi's Baphomet also influenced the design of The Devil in the Tarot Cards.